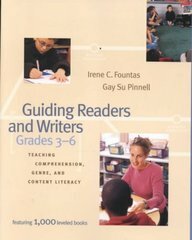 Guiding Readers and Writers 1 Edition Authors Irene Fountas and Gay Su Pinnell have already helped hundreds of thousands of K-3 teachers engage, inform, and inspire early readers and writers. Now, with Guiding Readers and Writers (Grades 3-6), Fountas and Pinnell support teachers on the next leg of the literacy journey, addressing the unique challenges of teaching upper elementary students. The product of many years of work with classroom teachers, Guiding Readers and Writers (Grades 3-6) is one of the most comprehensive, authoritative guides available today. It explores all the essential components of a quality literacy program in six separate sections: Breakthrough to Literacy: Fountas and Pinnell present the basic structure of the language/literacy program within a breakthrough framework that encompasses the building of community through language, word study, reading, writing, and the visual arts. The framework plays out as three "blocks," which can be interpreted as conceptual units as well as segments of time within the school day. Specific information on how to structure a reading and writing workshop is provided. A practical chapter on organizing and managing the classroom will help you implement the principles in your own classroom. Independent Reading: It is essential for students to develop interests and tastes as readers, selecting books for themselves every day. Fountas and Pinnell devote four chapters to independent reading, exploring how to structure teaching, minilessons, conferences, groupshare, and ways to use response journals as part of a reading workshop. Guided Reading: The chapters in this section provide detailed information on planning for guided reading, dynamic grouping for effective teaching, and selecting, introducing, and using leveled texts. Fountas and Pinnell describe characteristics of texts related to difficulty and ways to organize texts in your classroom and school. Literature Study: This section of the book discusses how to make students' experiences with literature as rich as possible. The authors offer specific suggestions for forming groups, guiding student choices, and establishing and teaching routines for literature discussion. A full chapter explores reader response and ways to help readers dig deep to uncover the meaning of texts. Teaching for Comprehension and Word Analysis: This detailed look at the reading process explores both oral and silent reading, processes and behaviors related to comprehension, and ways to help students construct meaning. Included are twelve systems for sustaining the reading process and expanding meaning, plus discussions of the important areas of phonics, spelling, and vocabulary. The Reading and Writing Connection: These chapters showcase the instructional contexts - poetry, writer's notebooks, writer's talks, genre, content literacy, and student research - that support students in connected reading and writing. An informative overview of the characteristics of fiction and nonfiction will help you teach students to read and write a variety of genre. What's more, the authors suggest ways to help students learn the "genre" of testing and perform the kinds of reading and writing tasks that tests require. They also detail the continuous thoughtful assessment that guides all aspects of effective teaching. A special feature appears at the end of each section, in which Fountas and Pinnell provide indispensable suggestions for working with struggling readers and writers.